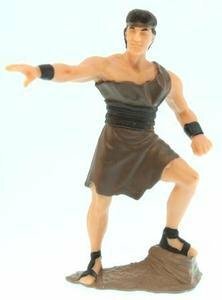 3" Nephi made out of durable vinyl. Nephi was the fourth son of Lehi and Sariah. He was a Book of Mormon prophet, and was faithful to his parents and to Heavenly Father. He was a skilled craftsman, building weapons, tools, and the ship that sailed his family across the ocean to the promised land. He showed courage amidst great danger as well as patience in dealing with his rebellious older brothers, Laman and Lemuel.